Alexandra was born and raised in Banff. 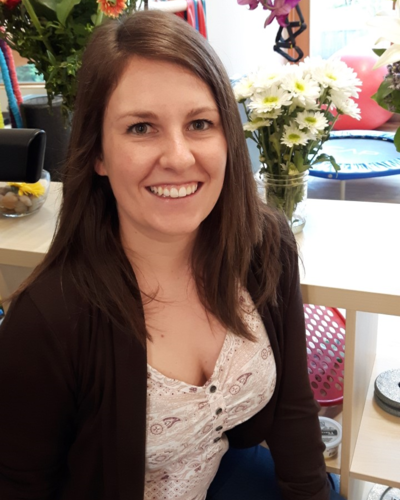 After completing her Masters degree in Occupational Therapy at the University of Manitoba she is very excited to be back in her hometown offering occupational therapy services throughout the Bow Valley. Alexandra began her journey toward a career in rehabilitation at the University of Alberta where she completed a Bachelor of Science in Kinesiology. She now works with 3-6 year olds with the Cause and Effect Foundation early intervention team in the Bow Valley and provides services to school-aged children under Family Support for Children with Disabilities contracts. She believes in using a strength-based client centred approach when working with children to work toward the goal of maximizing function. Occupational therapy involves working with individuals of any age with challenges in everyday activities. These can include anything that is meaningful or necessary to that individual; examples include writing, toileting, playing, socializing and getting dressed. Occupational therapists look at all areas impacting function including physical and cognitive abilities; as well as how a person’s environment affects their ability to engage in occupation.